What are the Advantages of Tape? What is the Typical Construction of Tape? Adhesive Tape is used in many different applications with new uses being discovered every year. The usage and diversity of tape will continue to grow as a solution to fastening and joining due to advances in adhesive technology, ease of use, and its low cost compared to traditional fastening systems. 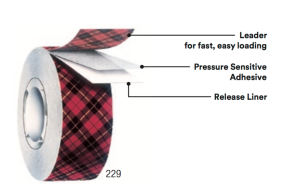 The following is to provide you with the basic advantages of tape and things to consider when determining the best adhesive tape for your application and/or certain industries. Provides structural strength that can replace bolts, rivets, welds and other mechanical fasteners. Can use lighter thinner materials. Bond dissimilar materials without incompatibility concerns. Acts as a moisture seal/environmental barrier. Provides vibration deadening and noise reduction. Eliminates the need for surface refinishing to remove weld distortions. Eliminates visible mechanical fasteners for cosmetic superiority. Provides adhesion to difficult surfaces such as glass. Provides uniform thickness and gap filling properties. Eliminates the need for bonding “both” substrates together at the same time and location providing optimum manufacturing flexibility. 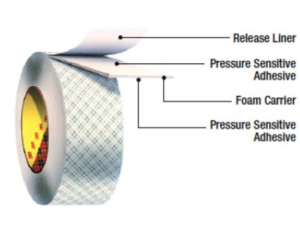 Typical uses of single coated tapes include label stock, wound care products, duct and insulation tapes. Double Coated PSA Tapes or Double Sided (PSA) Tapes: A carrier is coated on both sides with pressure sensitive adhesive (PSA). The carrier can be a wide variety of materials including plastic films, tissue, non-covens, cloth, etc. The adhesive is protected by the release liner coated with silicone on both sides. Carrier offers ease of handling and slitting. Can serve to reduce over laminating on porous materials. Carrier offers the ability to use different adhesives on each side (differential adhesive), enhancing application flexibility. Transfer (PSA) Tapes: An unsupported adhesive film coated on a release liner which is silicone coated on both sides. Transfer tapes offer superior conformability with irregular surfaces (e.g. textured, curved). Typical uses of transfer tape include nameplate application, bonding, foam bonding graphic displays, splicing etc. Double Liner Transfer (PSA) Tapes: An unsupported adhesive film protected by a release liner on both sides. Each liner is silicone coated on the side facing the adhesive. Generally used where the adhesive needs to be die cut prior to hand installation of adhesive to a finished part. Typical uses of double liner transfer tapes are commonly used in membrane switch industry and decorative overlays. Self Wound (PSA) Tapes: A carrier which is coated on one side with pressure sensitive adhesive (PSA) and on the other with a silicone release coating. Note: there is no release liner. Typical uses for self wound tapes include packaging tapes, electrical tapes, masking tapes, and duct tapes. Can-Do National Tape, an ISO 9001-2008 company and committed to providing the highest quality of pressure-sensitive adhesive products and related services at competitive prices, which meet or exceed customer requirements. Our experienced team of adhesive tape experts and equipment bring solutions to your problems. With over 100 years of combined experience with adhesive tape, non-adhesive products, product development, and manufacturer engineering, we’re able to assist in designing products that exceed your expectations.